Choosing the best musical instrument is sometimes hard. Some parents have found that the children’s ukulele is an ideal start for getting their kids interested in playing music. There are loads of benefits and some of my favorites are its size (super small) and easy to handle, it’s upbeat sound, inexpensive cost and how it can be easily transported. Therefore this review will explore everything about ukulele’s and assist you with making an informed decision. There are loads of different types of ukulele’s, which usually get classified by size, ranging from baritone, concert, soprano, and tenor. However, there are others but are less common and won’t find that easily. Each one has slightly different sound, tone, can be slightly lighter, sweeter sounding and have a unique shape. The size of the ukulele is ideal and really easy for them to handle, which is perfect for being handled. Most children’s ukulele has nylon strings and can be a huge benefit for their little fingers because steel can be tough and sore at first. Most other string playing instruments (guitar, bass guitar etc) use tougher strings and might be a steep learning curve for preschoolers. Children find ukulele easier to comprehend because there are two fewer strings than it’s brother the guitar. The stretching needed for guitar playing is usually more difficult and needs a wider span of hand, which children don’t have just yet. The ukulele for children is fun, great for singing along and an awesome tool for ear training. This sing-along instrument can get their friends involved and make their time together special. 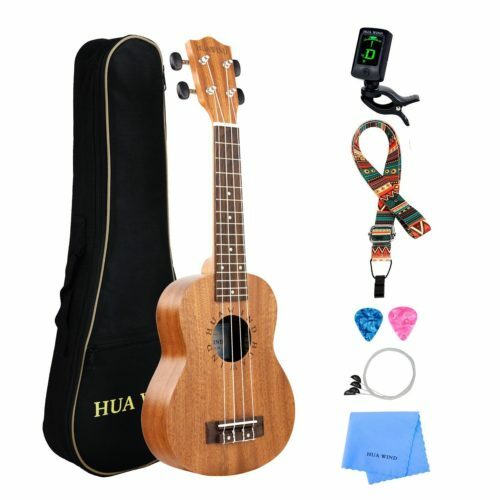 Below is a list of the best available ukulele’s for kids on the market, both in price and quality, so hopefully me filtering through them all will ensure your kid starts having a great time playing the uke, maybe even on their way to stardom like Jack Johnson or maybe Israel Kamakawiwo’ole with Over The ‘Rainbow & What A Wonderful World’ . Girl Themed ukuleles are a great way to get your child enthusiastic and wanting to strum until their heart is content. There are many different themes and by clicking the link below you can choose from an array of types and color. 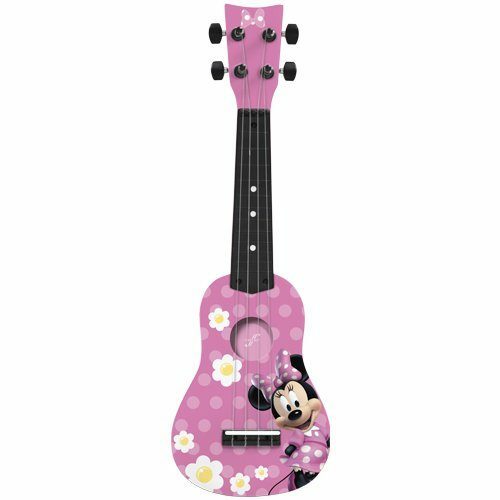 There are loads of reasons your child might latch onto this uke and want to sing their little hearts out, its pretty and Mickey themed, it’s small and brightly colored. The melody from this is less prominent than the others in this review and the melody will not be as enchanting although Mickey might disagree. This has been specially constructed and designed so that children can easily strum it. The strumming on this is super easy and the overplay is made for children of all ages, but especially those early developers. The size is 20.5 inches and the smallest in this review. The shape is traditional and offers a great user experience, so the ukulele is easy to hold and manage. This is important and the more they feel at ease with holding an instrument the more they will patiently endure the playing, but imagine the child doesn’t even like holding the instrument, it’ll be a down hill battle. 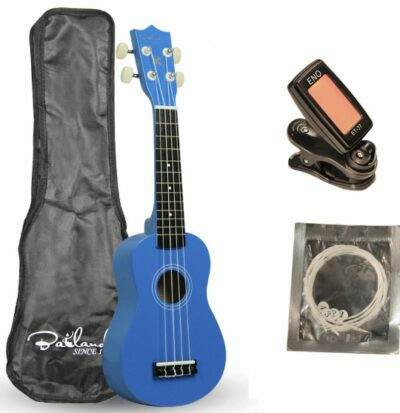 This is for a slightly older kid than the previously reviewed uke and although the color is plain the overall sound and design is more refined, so might be for the child that is going to be receiving some form of lessons. Aquila strings are slightly tougher on the hands and can be a struggle for some, but again slowly and surely is another way to build up finger strength, so be gentle with your teaching approach. Aquila strings are a synthetic material made from nylgut, usually made in Italy and have a warm tone to the ear. This is a little bit more expensive than the last ukulele and offers both sweeter tone and packs a larger punch in comparison. The bridge is more solid in design and offers a supporting structure for the sound to vibrate through the strings, which improves the overall quality of tone and sound I think. The fret is slightly longer than the previous and makes for reaching a little more difficult, but only if the child is extremely young in age and size. This also come with a bag and is handy if you’re going away and need to offer a basic layer of protection whilst traveling. The dimension and size are 21 inches and smaller than the one below which is 22 inches, which might suit a specifically more smaller child. This is for the child who has the desire to play the ukulele and will respect his new toy, because this has a stunning design, top notch material, and satin finish to stand out from the bunch, however this does mean that if the child will drop to the floor at free will or bang it around like it’s a teddy it is maybe best getting one of the earlier cheaper ukulele’s than this. The neck of the fret and body is made from mahogany and makes a beautiful piece just to look at let alone play, The sound, however, is deep and rich with an open feel to it, like you could be at the beach under a coconut tree. All the marked positions on the fret have made this easy to learn and with a quick glance positioning can be seen, which is important at the early stages of a child’s learning curve. There are 12 brass frets and each seems to complement the mahogany’s deep rich color. The size is 22 inches and the biggest yet in this review. The geared tuners are easy to use and make tuning easy. Some lesser quality ukuleles seem to cause problems with ages and the tuning becomes more difficult, but this seems to last the test of time. This particular ukulele comes pre-strung and ready for playing for those parents concerned with tuning at the beginning. The strings that come with it are aquila nylgut and fairly good quality without being too tough on the fingers. 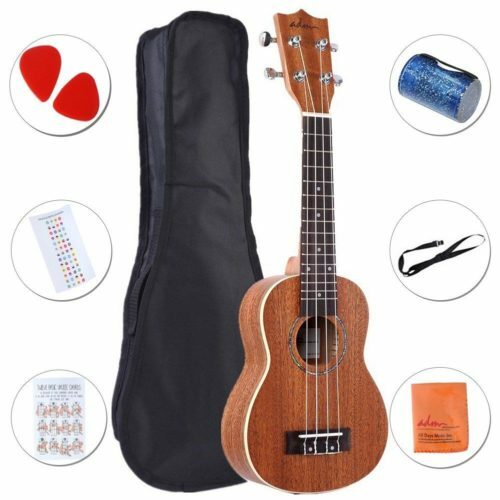 This cute little uke and is ideal for the beginner with loads of enthusiasm for getting playing. This comes as a starter pack and for those wanting their kids to have some additional plectrums and strings, it’s perfect. The high gloss finish covers the basswood and creates a lovely sound and tone. The strings are easy to play and nylon to touch. The size is 21 inches in the smaller range in this review, however, it does offer a higher standard overall than the Disney themed ukulele. The fretboard is hardwood and neck is maple, so the sound should be sweet with a dreadnought shape to assist with volume. This is a great all round ukulele for beginners and makes learning easy for those wanting it to get playing quickly. This comes with a guide to assist with the basics and takes away from the need to have a tutor straight away, however the more time spent with the child at the beginning the better, sometimes the difference between them continuing years of play and not. This ukulele doesn’t come with a tuning app, which could be handy for when they are on the go and heading round to their friend’s houses or when unsure what the right sound is meant to be, so make sure to pick one up as well. There is no bag, which does make the traveling easy and convenient so less likelihood of scratches and dings, so again pick up a bag whilst you in the checkout. Unless you want to have to shop around for a bunch of accessories, getting a starter pack for any instrument is a great way to save time and money. That’s why we love this great Mahogany Ukulele set, which comes with a bag, tuner, strap and set of strings included, so your little pop start can get down to rocking out right out of the box. 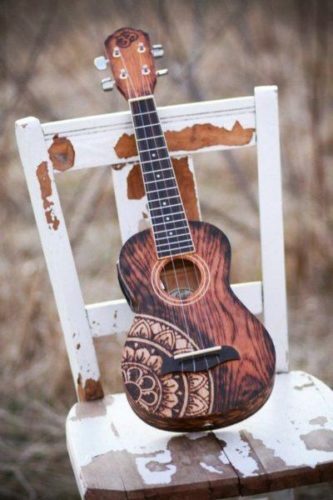 This mahogany ukulele sounds amazing, and has a very rich and warm tone to it, and it has adapted guitar tuners to make sure it stays in tune longer. It is also available in a choice of sizes, including tenor, concert and soprano, so you can get the right for your little one. Overall, this is a great little instrument and huge value for money. Sometimes, all you need is a neat little toy to get your child started on their musical journey. 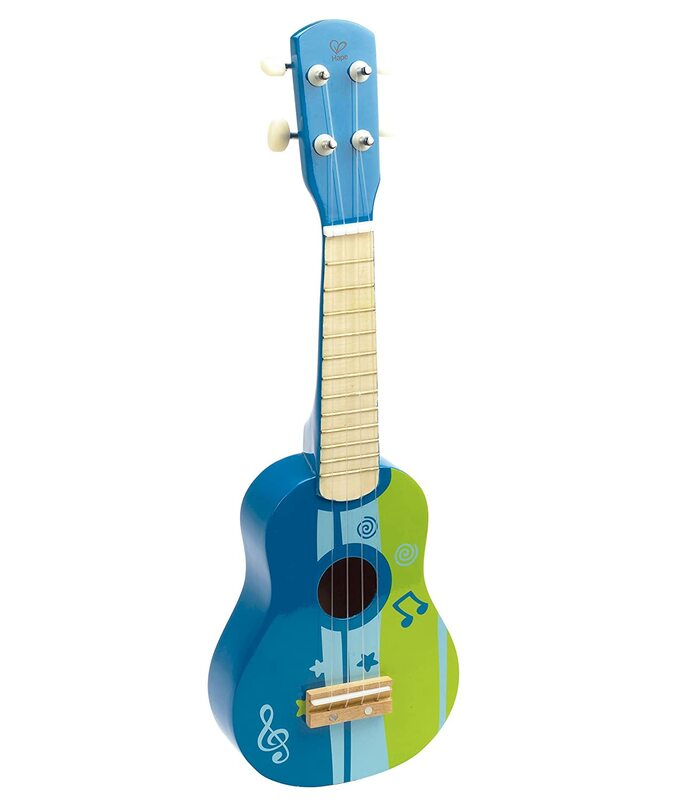 If your looking for something for a 3 to 6 year old, this colorful toy ukulele might be just what they want. This little thing is really cute and has great artwork, so your toddler will just love carrying it around and making some noise on it. Even though this is designed for the smallest hands, it is actually quite sturdy and quite tuneful, and your kids will be able to play actual songs on it and tune it. This is a great instrument for them to learn their first chords and songs on, and they’ll be really excited to play for the family with this cool instrument. With a mahogany body, walnut fingerboard and Aquila strings, this wonderful starter instrument not only looks amazing, but it sounds amazing too. This cute little ukulele has very high quality in both build and materials, and, if your child looks after it well, it might just last them a lifetime. This is a soprano uke, so it is the perfect size for little hands. Best of all, this comes with a whole set of handy accessories, including a gig bag, strap, electronic tuner, strings and picks, so your little one will have everything they need as soon as this great started pack arrives. Our favorite ukulele out of the bunch is the Kids mahogany Starter Kit. Not only does it come with all the basic accessories your child will need, like a gig bag and a tuner, it also has a lessons book and access to free online lessons, so your kid can get started right away. All this would mean nothing if it didn’t sound good, but thankfully, this sounds amazing too! If you’re not quite ready to really splash out on an instrument for your child or you want to wait until they’re a little older before you buy them something really good, the Wooden Toy Ukulele is a great budget purchase. Despite being a ‘toy’ this cute little thing actually sounds pretty good, and with its bold colors and sturdy design, this will be great for a 3 year old who wants to start learning to play or just one who wants to carry it around an make some noise. This is a really fun and clever book that gets kids up and playing right away. With two books for level 1 and level 2 players, these lessons really take the chore out of learning an instrument and explain in simple terms that both kids and adults can easily understand. Each lesson is guided by one of three cool cartoon animals, including an alligator, a cat, and a dog, who make everything very child-friendly and simple. If you want to not only help your child get to grips with the instrument but also spend some quality time with them as they do, get this! This is just right for kids picking up the instrument for the first time, and especially for those who have no musical training. 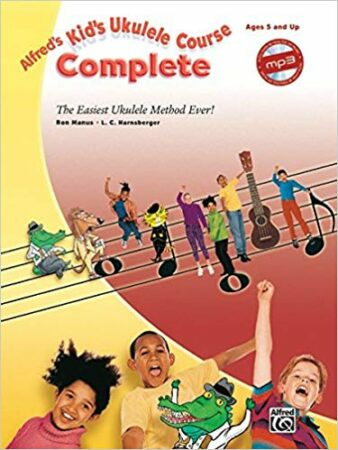 This book, written by No.1 best selling music author Ben Parker, does away with sheet music and such and instead uses very clear and simple diagrams and photos in order to teach them their first chords and get them up and playing. This book is really good for kids who aren’t interested in or are too young for learning musical theory, and they can always learn that later on if they want. The simple lessons and exercises are really kid friendly and will give them all the basics that they need in order to play their favorite songs can gain confidence with the ukulele. I don’t know about you, but I’ve never met a child who doesn’t love Disney, so if your little one is getting into the violin, this wonderful Disney songbook might be a really good git to go along with it. This includes around 20 classic Disney songs adapted to the Ukulele, and has fan favorites such as Beauty and the Beast and When You Wish Upon A Star. 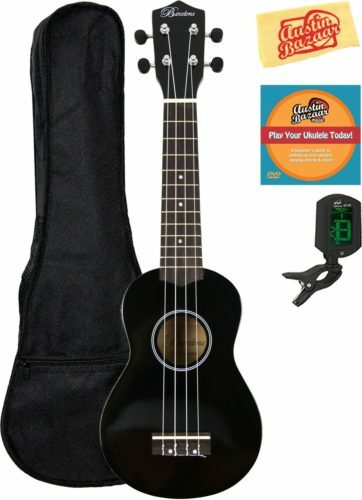 Unfortunately, it doesn’t come with any lessons for playing he Ukulele in general, so you child will only be ready for this once they have gotten the hang of playing. It also assumes that your child can read music, which may be an issue. Still, this might be a great thing for them to work towards if they are taking music lessons. Kids do tend to get things grubby quite quickly, so an important part of learning any instrument is learning to clean it well. You want to keep your kids Uke in good condition, because not only will a clean and well maintained Ukulele feel much better in their hands to play, it will sound a lot better too. Luckily, you can use any guitar cleaning kit to keep that Uke looking shiny and new, and we recommend this Dunlop cleaning set. This great set has 5 different cleaning fluids and a set of cloths, which is all you’ll ever need to clean the instrument. Better still, it has a handy set of instructions with it, so no prior experience is necessary. While most kids like to play the Ukulele while sitting down, sometimes they might wanna stand up and play. This might be for a performance, or just rocking around in their bedroom. In any case, its always good to get kids a nice Ukulele strap, so they have the choice. 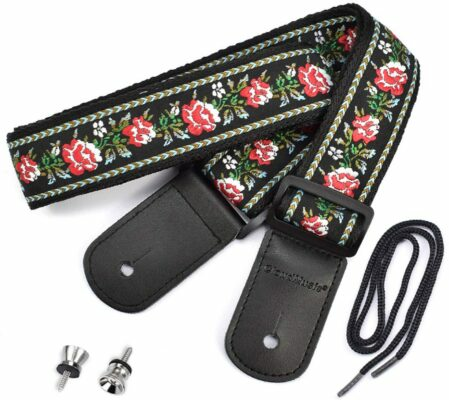 This particular strap is not only gorgeous, but its is designed to be comfortable and keep the Uke well balanced while playing. It will fit soprano, concert, tenor and baritone ukuleles with regular sound holes and especially good for side sound hole, grape sound holes and other irregular sound holes. Storing musical instruments is always a bit of a challenge. The bets thing to do is usually lock it up in a case when not in use, but that can become a chore if your kids have to do it every time they want to play. However, leaving it on the floor or leaning on a wall is dangerous, as they can easily be tread on or knocked over and seriously damaged. 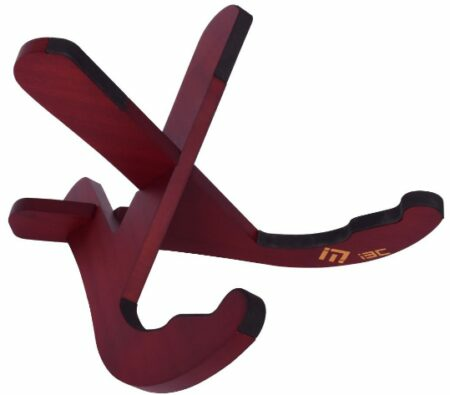 We recommend getting a simple ukulele stand, like this one. It is very easy to assemble, light and durable, and its a great way to ensure that the instrument is stored safely and out of the way when not in use. Ask any musician for the number one cause of broken instruments in their lifetime, and more often than not they are going to say transport. Whether its bumping them on walls, or getting knocked about on the bus or in the back of the car, moving an instrument around is the most dangerous time in its existence. For this reason, you want to get a nice padded carry bag for your child’s Ukulele. We love this bag in particular as not only is it really stylish, but it is thickly cushioned to protect from bumps and knocks, and its especially reinforced around the weak parts of the instrument, such as the headstock. Get this to make sure that uke makes to and back from band practice safely. Some say the most import aspect of choosing ukulele is the durability of the string. Parents worry saying ‘will my over eager child need a particular type so as for best not hurt themselves?’ and yes each type offers a slightly different touch, tone, and feel, however, each will have its own unique positives and for a toddler making it fun is the key. People often say the best ukulele strings overall are the Aquila nylon string, which has been made to endure higher temperatures and humidity. These strings do offer superb sound quality and the touch is sweet. Choosing the right ukulele strings for children is sometimes difficult, and some say nylon is ideal for easy pressing and others say Aqyulia nylon strings. There are differences between the two and choosing the right type isn’t going to make a big difference on its own, because other factors also come into play. For example the ukulele size and shape can make the strings feel tighter than others, play style makes a difference too in choosing string type and lastly, the strumming or Picking style determines a choice of strings also. So, what does all this mean you’re asking yourself right? Simply don’t worry too much about this just yet and go with a pair that is already as standard and see whether the kid likes playing, because all ukulele’s respond differently to the same set of strings, so simply there isn’t a right answer for this question. There are two types of materials used for constructing the ukulele instruments, wood, and composite/plastic. Each offers both pro’s and con’s but ideally, it depends on how and for what purpose you are going to be using the ukulele. Some want to use up the river on camping trips and others for impressing guests at dinner parties, so for children, the thought might be that kids need ones that can get carried about and the occasional bang without a worry about breaking easily. Another advantage is that these composite plastic types don’t get affected by weather and climate, so bearing that in mind can be helpful. The type of wood in the ukulele does make a huge difference to the trained ear because the density of the material and ultimately the vibration makes for the sound to alter between woods. Mahogany – most commonly used and great for the neck of the ukulele, The sound is in the middle of the spectrum. There are loads of unique shapes and sizes for ukulele’s and finding the right one for your child isn’t as difficult as it may seem initially. The classic figure of eight is usually the basic shape and is found most common, although there seems to be a trend of new weird and wacky designs coming onto the market all the time. The figure 8 is very common but also terms like vita or others like pineapple offer slightly different tones on their own. For children, this will not matter so much as long as the size of the ukulele is according to their overall size and height. Children and preschoolers love all the Disney characters and the more the emphasis put on ukulele design the more likely they will want to pick it up and practice singing a song. 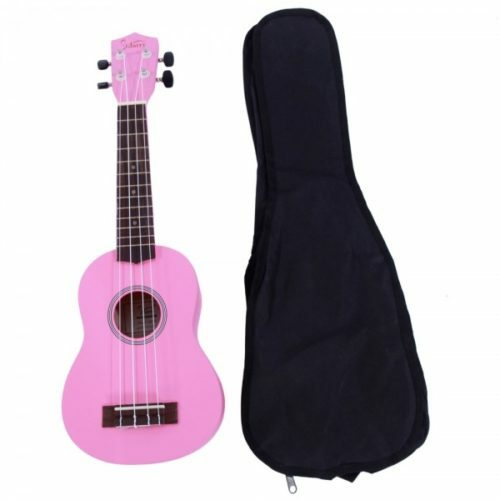 The colors can be for some kids the distinguishing factor between liking their latest toy and not liking it, so if your little girl loves pink then get her a pink ukulele. The themed ukulele come in all sorts of themes ranging from mickey mouse, avengers, frozen and all the way through to ninja turtles, so find the one that will suit your child. Children usually can’t distinguish between a good sounding ukulele at the early stages, but will quickly learn to distinguish if they are playing or learning as part of a group, so knowing what circumstances your child will be playing in is worth noting before buying. The ukulele general rule is the more you spend the better quality the sound, but sometimes there can be unique buys that defy this general rule and seems to create a sound that mimics the original Hawaii grooves. The best instruments for kids can also be the cleanest and the more a child plays the dirtier the ukulele gets. We produce sweat and that gets all over the ukulele and needs a good clean every once in a while (3-6 months), kid tends to be messier and if you have a wooden uke the more frequent the better. There are a few different techniques to cleaning you ukulele and sometimes a cloth is enough and other times a specific oil (dunlop’s 65 oil lemon), but simply maintaining your fretboard and strings will ensure a better quality of sound and improve the uke age expectancy, ideally, it can last a lifetime and beyond. I always think the best deals are on Amazon and they offer a full range without costing too much, which when compared to specific brand shops and outlets can be an All-mighty saving.